This is also from my father by way of post war Germany - we think it is a Villeroy and Boch plate but found it online under Mettlach Charger. were a set of 4)- when I do I can send you pictures if you have any interest - I assume you have better things to do. even before I was in the industry. There is something very special about this company. On the subject of your previous query, please do go ahead and forward the photos and report what more you have found out about the Nubian Figurines by Rosenthal, I would be very interested to hear what you have learned. Mettlach is a name synonymous with quality and value. Mettlach (named after the village) is one of the many factories of Villeroy & Boch (V&B). Located on the Saar River in Western Germany, very close to France and Luxembourg the Mettlach Pottery factory is on the grounds of a former Benedictine Abbey dating to the 10th century (see my A - Z China manufacturers guide). Mettlach has produced dinnerware, ash trays, plaques, pitchers, jars, vases, and beer steins amongst other various wares. The above photos give an idea of the most common 'Mettlach' V & B pottery marks. There are some other different Mettlach Villeroy & Boch (V&B) pottery marks, but I understand they are more rare than the above shown (I don't know this for sure, but this is what I was told). Hope this information helps Philip. I look forward to hearing from you again. of christs crucifixion in black and cream glaze. I am in possession of a V & B Bowl of roughly 12" diameter with a designe of a male and female pheasant. The mark on the bottom is a castle with V&B Bonn inside of it, and Alemania underneath the base ot the castle. I would welcome any information regarding age & value. I HAVE A V&B METTLACH SET OF DINNER WARE. WITH SERVING BOWL W/LID, GRAVY BOAT AND PLATTERS. OFF WHITE COLOR WITH 24K GOLD TRIM. THE MARKING IS LIKE A COAT OF ARMS OR SOMETHING AND IT SAYS VILLROY & BOCH METTLACH. MADE IN FRANCE-SOAR AND UNDERNEATH THAT IS ECONOMIC UNION AND THEY ALL HAVE A LETTER. THE GRAVY BOAT IG A G UNDERLINED AND THERE IS ANOTHER GOLD MARK. THANK YOU.. I have a medium sized bowl from V&B (second stamp you featured) I have tried to do some research and find out more about it, but nothing similar. The pattern on it is Chinese looking with palm trees. Do you have any comments or advice on who I could ask? Name and country are arranged in an oval shape around "MADE IN" and the "N" is backward. It also has the number 499 stamped in black. I have a V&B jug and sugar bowl,cream and mustard with brown uneven vertical and horizontal stripes. Has the mark of the second picture but has 'Biarritz' and the number 2 at the top of both and 'Bern' at the bottom. I have a 12 place setting of vintage china with 2 different V&B markings. I have also tried to have the set which includes covered vegetable bowls, 2 covered gravy boats salad and soup plates. One of the markings is the one you have on the right with a second with blue surrouded with black arrow through it. Mettlach stamped in middle 334 underneath. I have a 16inch wash basin with the Villeroy and Boch marking and Dresden on the bottom. It is cream in colour and in very good condition. I have no idea how old it is. Thought to be used 1874- 1909. There is a separate thread on this marking specifically. I have a V&B Milk Jug.Royal Blue Garlanded with inset milk drops,approx 8 inches tall.The base has the V&B mark with Dresden underneath.it is inset stamped with the number 3 on the base. 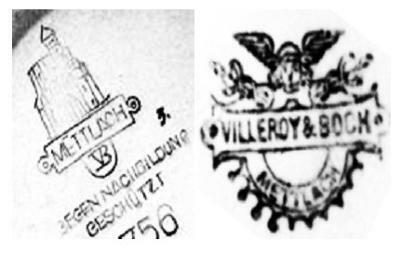 It is the "Mercury" Ink stamp of V&B Villeroy & Boch with "Dresden" as the factory location. Please go to www.figurines-sculpture.com/a-real-or-fake-villeroy-boch-pottery-mark.html for more information. The front has large mushrooms a fairy standing on on and an old man sitting on a mushroom eating from a bowl placed on another mushroom. He is using a long handled spoon. Background color is blue with gold around the edge There are three stars at the top. I have a Mettlach vase and I cannot find the mark anywhere. Can anyone help?It is in gilt letters and is a cojoined Jand T followed by ALPING. I do not know if it is J Talping or T Jalping. It is impressed no 3014 with CD also. V&B Mettlach. It is the name on it I am finding puzzling. Many thanks for your help. V&B M 5169 plate depicting father and son on side of a dutch canal waving to boats. Father holding fishing net, son holding toy boat.